Do you ever buy a book just to read it before the movie premieres? I’m guilty of this, especially when there is a shiny, stylish new cover (this one with Anne Hathaway and Jim Sturgess). 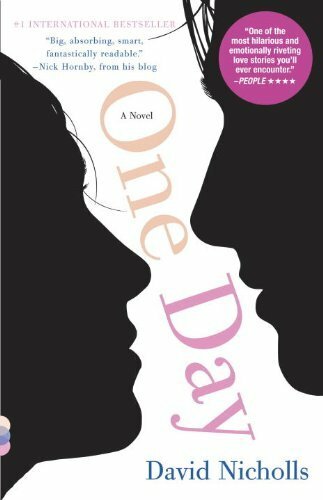 In addition to the attractive new binding, the premise of One Day sounds completely intriguing: the relationship of two friends, confidantes, and possible soul-mates is revealed with a peek at just one day – the same day – over the course of twenty years. I gave myself a good two weeks to read One Day before the movie came to theaters, and hoped to love it enough to eagerly anticipate the movie (author Nicholls is the screenwriter too, always a good sign). Unfortunately, the book was such a disappointment that I could barely finish reading it, much less even consider watching the movie. Saved a good 20-30 bucks on movie tickets – my husband thanks you, Mr. Nicholls! In fact, I probably won’t even spring the dollar for Redbox – that’s how much I don’t want to see this movie (and of course, how much I did not like the book). It’s a shame too because again, the premise really is a unique, terrific idea that’s chock-full of potential. Dex and Emma’s friendship begins at graduation in college. He is a cool kid that wants to “live life to the extreme, but without any mess or complications…in such a way that if a photograph was taken at random, it would be a cool photograph.” She is a motivated, ambitious, and passionate student with a desire to make a difference; needless to say, her intellectual interests and individualistic ideas make her a bit nerdy and seemingly opposite in every significant way from Dex, her unrequited crush. This is the characterization revealed on the first day of their connection, July 15th, 1988. For the next twenty years, we drop in on Emma and Dex as they experience job frustrations and lack of direction, addictions and successes, changes in their friendship, romantic hits and misses with each other (and others), and finally, major developments that the book has been slowly, dramatically, and solidly building. Sounds pretty decent thus far, right? The first three-quarters of the story is actually interesting and involving, and the writing is solid – Nicholls creates empathetic and revealing characters. Unfortunately, in the last part of the novel, the story completely falls apart. I really want to avoid giving major spoilers, but boy, the ending of One Day is just awful. Not awful solely because of the specific plot developments (One Day‘s resolution often works very well and cultivates theme and meaning in other stories), but terrible due to a resolution that feels cheaply planned and thrown in without any distinguishable purpose. Nicholls does a real disservice to his readers who have invested their time and emotion in his story – I felt gypped by the random and unsatisfactory ending, and as a result, I will not be reading any more by this author, regardless of movie versions and new, stylish covers.